The book offers a preliminary report on a season’s fieldwork at an Ubaid¬-period settlement in the Kuwaiti region of Al-Subiyah. The site of Bahra 1, the largest of its kind in all of the Gulf region, has yielded both Ubaid and Arabian Neolithic artifacts, proving intensive contacts of the site inhabi¬tants with Mesopotamia in the first half of the 6th millennium BC. An overview of the architectural remains excavated in the two site sectors presents some observations on the various wall and floor construc¬tion techniques and highlights the different character of the two areas. Discussion of the most intensively excavated architectural units offers insi¬ght into the stratigraphy and phasing of the site and, consequently, allows for some conclusions as to the development of the settlement. The aims and preliminary observations of a geological and geomorphological survey are summarized, with the main focus on the reconstruction of the Holocene shoreline in the Bahra area. 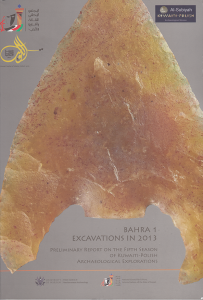 Separate chapters discuss the different classes of finds from the 2013 season. The season’s pottery assemblage of almost 3,000 frag¬ments consists almost in half of Ubaid pottery imported from Mesopotamia. The lithic assemblage is of a local character and includes predominantly chipped flints and quartz with a much smaller share of ground and pecked stones. The array of small finds discovered in 2013 is typical of the repertoire of shell, clay and stone objects from the site as known from previous fieldwork, and confirms the presence of a tubular shell¬-bead producing workshop at the site. Identification of the poorly-preserved animal bones from the site allows for some preliminary conclusions as to the animal economy of the settlement.